A patient lost a testicle during an operation because the surgeon cut it off by mistake, a General Medical Council (GMC) hearing has been told. Dr Sulieman Al Hourani was only supposed to cut out a cyst, but removed the whole right testicle instead. Dr Al Hourani was a locum surgeon at Fairfield General Hospital in Bury, Greater Manchester, at the time of the surgery in September 2007. He is accused of misconduct and also of stealing medication. It is alleged the doctor, who is now practising in Jordan and was not present at the hearing, also injected himself with a drug meant for a patient. Sarah Prichard, counsel for the GMC, said the mistake was made as a nurse helping the surgeon turned her back to get a stitch. When she turned around the testicle had been removed. Ms Prichard said: "Literally as the nurse turned away to get a transfixion stitch, the incident occurred and the testicle was removed. "Such was the level of concern they immediately realised it could be a serious medical incident and took steps to complete the relevant documentation." A month later it is alleged that the doctor, who qualified after studying at Jordan University of Science and Technology, stole two boxes of dihydrocodeine from a treatment room on a ward at the same hospital. 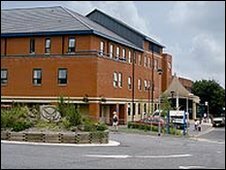 An investigation was launched and the doctor was dismissed by his employer, Pennine Acute Hospitals NHS Trust, which ran the hospital. The GMC was told of another incident in August 2006, when Dr Al Hourani had consulted a colleague and was advised to inject a patient with 10 milligrams (mg) of midazolam, a powerful sedative drug. He then gave the patient 8mg and injected himself with the other 2mg, the hearing was told. The case against Dr Al Hourani is being heard in his absence as he was notified of the hearing but chose not to "engage" with the GMC or appoint lawyers to represent him. The case, scheduled to last three weeks, was adjourned until Tuesday.